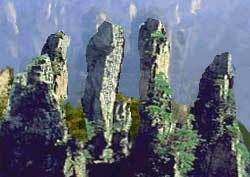 This vast area is most famous for its 3,000 quartzite limestone rock pinnacles (see photo). Some are as high as 20 story buildings. Each is uniquely shaped and some resemble familiar animals or objects. Viewing the panoramic vista from the top of Mount Tianzi (accessible by trail or cable car). Touring the sizable Huanglong Cave. Hiking along the picturesque Golden Whip river. Trekking in the dense, virgin subtropical forest that covers most of Wulingyuan. Visiting the ethnic Tujia villages. Mid April to mid May and mid September through October are the best times in terms of climate to visit Wulingyuan. If you are visiting during the peak season (late May through September), go on weekdays because the desired natural serenity of the Wulingyuan scenic area is traumatized on weekends by droves of bullhorn toting tour guides.